Secondly, it is a common device to keep our private lives separate from public domain. It is like saying: “Do not ask me anything else, because I have no time to share more details with you.” Sometimes, even among close colleagues in the office, people do not share as readily as they wanted to, simply because they prefer to keep their private lives away from nosy people. Moreover, in a competitive world, one will never know if others in the office are seeking to play politics using private information. Thirdly, busyness is also due to mindless overwork. In any situation where an employee is insecure, there is a tendency to take on more work than necessary just to prove a point. Too much work, too little time and inadequate rest are three potent ingredients for concocting eventual self-destruction. The Chinese word for ‘busy’ has the radical word ‘heart’ on the left, and ‘death’ on the right. Put together, busy is literally 'killing the heart.' I have previous expounded on the word in my other blog here. Fourthly, busyness is simply a word to stay superficial. It is too risky to open up ourselves to so many people. ‘Better to be safe than sorry’ is the philosophy of such people. In fact, this has to do with age as well. I notice that the older one gets, the fewer close friends one has. One may have many acquaintances but friends are few in number. Chances are the older one is, the more selective one becomes when choosing between friends and acquaintances. Finally, I will suggest that busyness is simply because we have lost track of the need for space. Even worse, we have become uncomfortable with space just like we feel uncomfortable in a group when no one is talking. This state of discomfort is a symptom of our restlessness. We choose to put busy activities into our lives in order to feel fulfilled. We feel that doing nothing in itself is a waste of time. So we fill up our lives with all kinds of activities, sometimes without much thought. It reminds me of a buffet, where one piles up food to fill every corner of the plate simply because one seeks to maximize the dollar paid. Unfortunately, when we are too busy, we lose track of what we are doing, and we fail to adequately communicate clearly to others. One may type a lot of letters on the computer keyboard, but without the space in between words, there is no meaning. 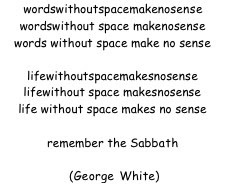 George White’s example above tells us the importance of space. Think about what kind of space you are giving yourself during times of stress and busyness. Have you been taking time to rest and make space for more important matters? For loved ones? For God? When was the last time you simply take time off to read the Bible patiently? Pray without rushing for time? Have you had coffee with a friend without constantly checking the clock? When is the last time you actually celebrate the Sabbath? When did you last do your Sabbath walk? Remembering the Sabbath is a way of making space. Once a week. Thought: It is important to make space for God and people. Have you ever thought about fasting from email or Internet once a week, so that you can make some space? Try it.